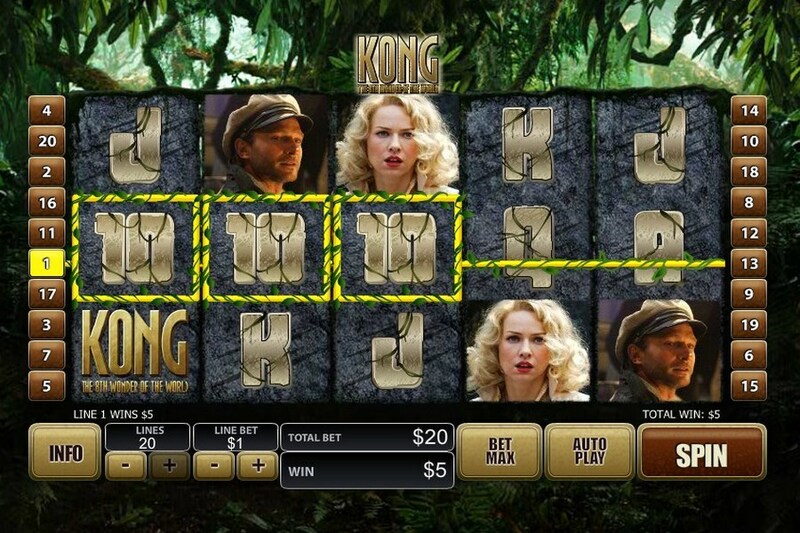 The slot machine game Kong The Eighth Wonder Of The World plays on 5 reels and up to 20 paylines, with bets ranging from €0.01 to €20. The game features two alternating, but similar game modes. You start in the Jungle Mode and remain there until you play the Jungle Mode Bonus Game, after which you move to the Big City Mode. The Big City also has a bonus game, after which you move back to the jungle. 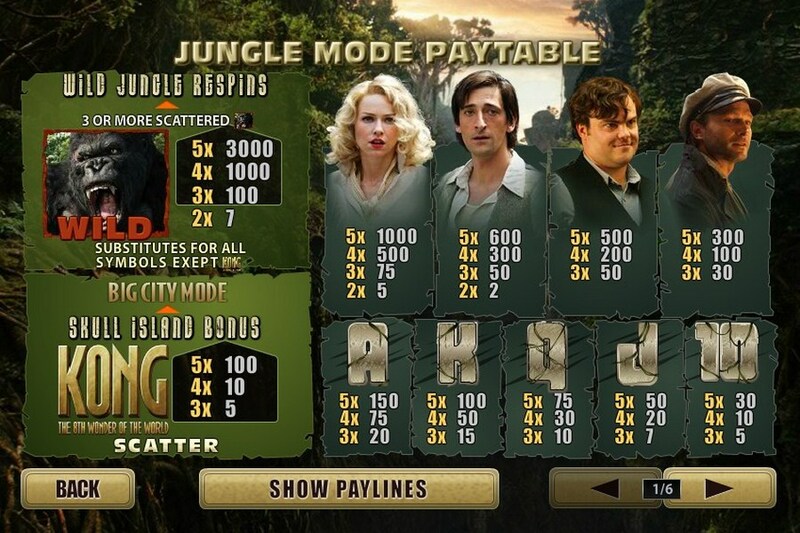 The Wild in the Jungle is a replacement for all symbols, when completing a winning line, while three or more appearing anywhere on the reels awards the freezing feature, locking those Wilds in place while 3 free spins take place. The Big City Wild also acts as a substitute, while adding a different feature when 3+ are present on the reels. This scenario awards 3 free spins with different combinations of guaranteed Wilds on the reels. Scatter icons take the shape of the Kong logo. These symbols can trigger a feature when they appear 3 or more times on the reels. Players can also pocket scattered win worth 5x, 10x, or 100x their total bet for 3, 4, or 5 scatters on the screen. There are methods of gameplay in this online slot game. Jungle Mode, and Big City Mode. 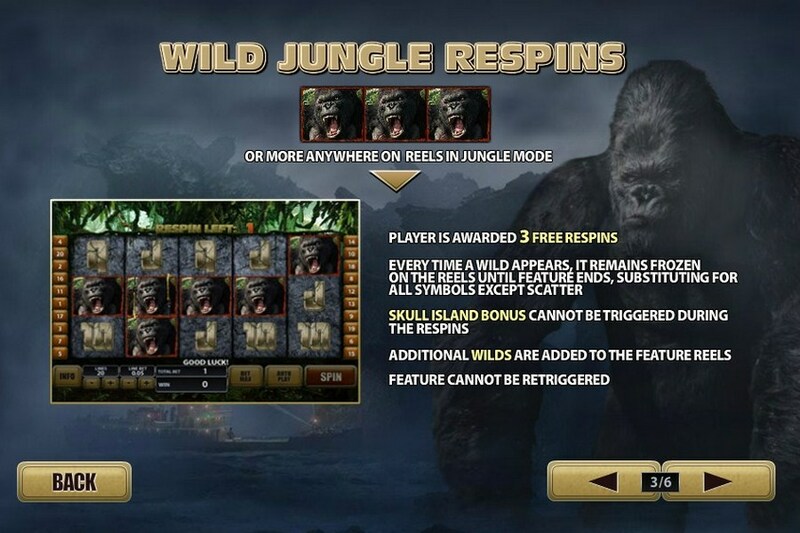 In Jungle Mode, you will be able to trigger a Wild Jungle Re-spin feature with 3 Kong wilds, as well as the Skull Island bonus with 3 scatters. In Big City Mode, players can trigger a Wild Kong re-spins feature with 3 Kong wilds, and the City Tower Bonus with 3 scatters. The Wild Jungle Re-spin feature offers 3 free re-spins with frozen wilds on the reels. Meanwhile, the Skull Island bonus offers you the chance to pick from 3 locales to win cash prizes. Wild Kong Re-spins offers players 3 free re-spins with the first and fifth reels wild on the first spin, the second and fourth reels wild on the second spin, and the first, third, and fifth reels wild on the third spin. The final bonus is the City Tower Bonus. It can see Kong climb the City Tower, and knock out planes to win instant cash prizes.